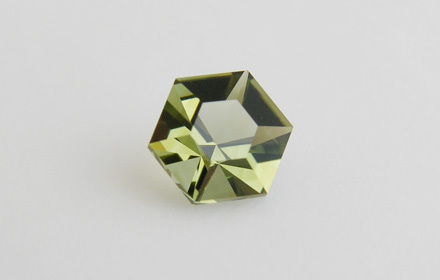 Weight: 0.32 ct; size: 4.87 | 4.25 | 3.08 mm; shape: hexagon; colour: medium dark yellowish green; very slightly greyish; clarity: slightly included; cut: excellent; treatment: none. Very clean specimen; design ‘Hexamixtum S 42-32’, excellent cut by Tan Pen. New find.